News by Britta S., Lindsay M., and Matt S.
Your phone, now featuring Sega classics! I am so head over heels in love with Sega due to its news that it is difficult to express the deep sentiment running through my veins. The company has announced Sega Forever, a collection of classic games for mobile phones launching on June 22. Sonic the Hedgehog – The 1991 classic, now in the palm of your hands! Phantasy Star II – The 1989 fan-loved RPG. Comix Zone – An American title developed by Sega's STI in-house studio. Altered Beast – The beat-em-up Genesis pack-in title set in Ancient Greece. Sega Forever will launch on iOS and Android (no word on Windows phones). It is free-to-play with in-app ads; the ads can be removed for the nominal fee of $1.99 USD, although I'm not sure if that's overall or per game. It's a reasonable regardless. The iOS version includes iMessage stickers, certain to fuel my current obsession. Sega promises the lineup will expand over the years to include "official emulations and ported games that pan all Sega console eras, each specifically adapted for mobile devices while remaining faithful to the original games." What would you like to see next in Sega Forever? 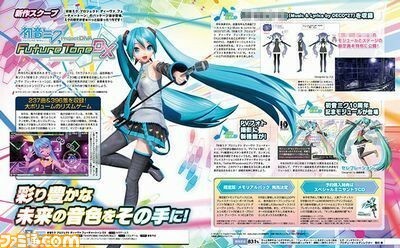 Okay, that’s a slight exaggeration, but SEGA is giving us a “new” take on the previous, brilliant, Hatsune Miku: Future Tone. Hatsune Miku: Future Tone DX will be the first time the game has been released on a physical disc (good for collectors), and has on it the base game as well as all DLC. But wait, there’s more! There’s new feature called ‘promotional video photographing,’ and while I have no idea what that means I could spend all day photographing Hatsune Miku, so that sounds good to me. There’s also three new songs, including Ghost Rule by DECO*27 (because a game with 230 odd tracks really needed more music), and new costumes such as a special 10th anniversary commemoration module designed by Mari Shimazaki. There’s no western release announced, and as it’s a relatively small enhancement on the existing Future Tone I don’t think we should expect it either. But I’ll sure as heck be importing it when it lands, exclusively on PlayStation 4, on November 22. Note: If you have the original digital version of Future Tone, you’ll be able to get DX as DLC content instead. Obviously you’ll need to buy the game again if you want the disc though. Wannabe classic-style cRPGs are a dime a dozen, so it’s either brave or foolhardy to attempt yet another stab at this hard-to-nail genre. But that’s what Portuguese BigMoon Studios (Lichdom Battlemage, Alekhine’s Gun, WRC5) is doing with Demons Age. I keep wondering… should there be an apostrophe somewhere? Demon’s Age or perhaps Demons’ Age? Hey, Demon’s Souls had one! BigMoon says on its website that the project is described by the developer as a dark fantasy game inspired by classic games such as Baldur's Gate and The Temple of Elemental Evil. You’d expect the view to be top down and combat to be turn-based, and don’t worry: they are. Pleasingly, the grid is hex tiles. The game was originally promised for Q1 2016, so this obviously took quite a bit of extra QA or polishing; but we now have an announced release date of June 30, for PS4, Xbox One and PC. The story starts with a shipwreck. You, a galley slave, have washed ashore on the coast of Moragon. The kingdom of Lijak is in turmoil, with demons invading in large numbers. The cause appears to be the breaking of some magic seals by a mysterious figure referred to as the High Emissary. It is now up to Princess Pellora Lijak and her brother, Prince Karan, to take command of the fight against an evil from ancient times. Apart from the usual battle features and puzzles, there is another layer in how various recruited characters may behave; they have their own agendas and may turn out loyal or traitorous. Your own character can be set up and customised with a comprehensive editor. The early gameplay I checked out looked impressively clean in the visual department; the dialogue however felt a bit stilted. Developer Airship Syndicate of Austin, Texas, was founded by four industry vets from Vigil Games, best known for Darksiders. That legacy shines through in their debut project Battle Chasers: Nightwar, which was crowdfunded via KickStarter. If the title sounds familiar, that’s because the game is based on the Battle Chasers series of comic books (1998 to 2001), authored by Joe Madureira, who also was creative director for Darksiders and Darksiders II. How often have we heard this before? Game XYZ is an “RPG inspired by the classic console greats” … Yea, right. But in the case of Battle Chasers: Nightwar http://www.battlechasers.com/ this may actually prove a meaningful statement, from what I’ve seen so far. Have a look for yourself at this Switch Reveal Trailer; I find the visual style highly appealing, with the comic book-style cutscenes in particular very dynamic and arresting. The story is centred on a historic monolith, shrouded in a ‘wall of mist.' Any adventurers who enter there never return. A young woman named Gully sets out to discover what happened to her father, Aramus, and to this end recruits five other adventurers. They will have to face randomly-generated dungeons crammed with traps, puzzles, and loot, and enter turn-based combat with beautiful battle burst animations. The six heroes are all based on the classic comic series; you take three into battle. There’s a deep crafting system, and an overworld bursting (!) with hidden dungeons and rare bosses. Publisher THQ Nordic and Airship Syndicate have announced the release date: Battle Chasers: Nightwar will launch for PlayStation 4, Xbox One, Switch, and PC on October 3.